I thought I should update this blog, as two more years have passed since the last time I looked at this phenomenon. 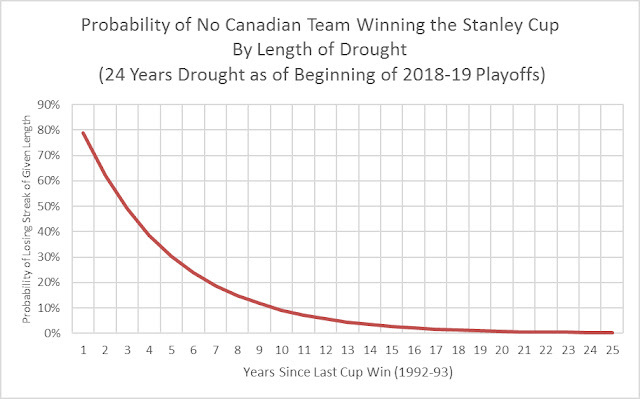 The statistics on Canada’s long run of years without a Canadian team winning the Stanley Cup have only gotten worse. 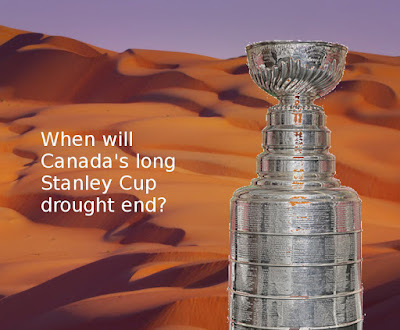 There have now been 24 straight years without a cup – should this year prove dry as well, that will be 25. That would be the Silver Anniversary of not winning the esteemed, and partly silver cup. At least this year 3 Canadian teams made the playoffs (about what one would expect from probability theory) – the last time I looked at the drought (2016), there were no Canadian teams at all. So, the updated question is “what are the odds of no Canadian team winning the cup for 24 straight years?”. It turns out, that’s a very low probability event, about .0033 in usual probability terms, or 0.33%, when expressed as a percentage. In other words, about 1 chance in 300. One way to calculate that is via the binomial theorem. You can look that up in a table (lots of them can be found on the internet, or you can find one in a stats textbook), or use the excel function BINOM.DIST. 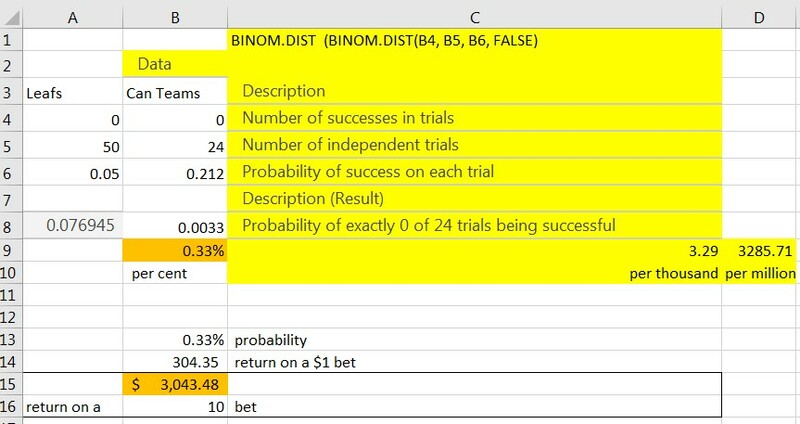 The calculation can be described as “how many times would you get 0 successes in 24 trials, assuming the probability of success in any given trial was about 7/31 (actually, I used .212 instead, to reflect the changing percentage of Canadian teams in the league over the 22 years). It is also interesting to see how the odds of the losing streak change, as the streak grows longer. I calculated those odds for streaks from 1 to 25 years, and graphed the results, as shown. As you can see, the odds of this have been quite low for a long while. Another way to look at this, is to calculate how much money you would win on a bet like this, as the streak increased. The accompanying graph shows that, if you had walked into a betting shop and made that bet in 1994 for $100, you would now be on track to pick up nearly $40,000. 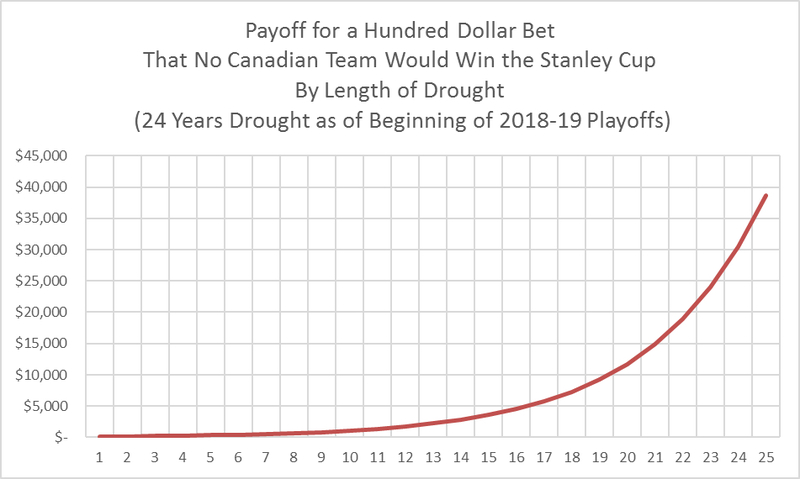 Obviously, betting that a losing streak would last for two decades or more, is a pretty slow way to make money, but in illustrates just how unlikely such a long losing streak really is. · Make 7 of those Canadian teams, via assigning a 0/1 variable, with Canadian=1. · Assume that the team with the highest random number won the Cup that season. Do this by finding the maximum randomly assigned number (use ax(list)). · Assign a 1 in another column to the team that has the maximum value (use if(team=max_random, 1, 0) . · Multiply this column by the Canadian/NonCandian column, and put the result in a new column. If the winner is a Canadian team, that column will total to 1, otherwise it is 0. · Now, you have determined whether the Monte Carlo has a Canadian team winning the Cup in Season 1. · Repeat that 23 more times, to simulate 24 straight seasons. · Calculate the sum of the Canadian winners over the 24 simulated seasons. · Test to see how often that comes up to 0. When I did this, I found only 1 occasion in my 24 season streak tests, out of 1000 trials, where no Canadian team won the cup during that stretch. 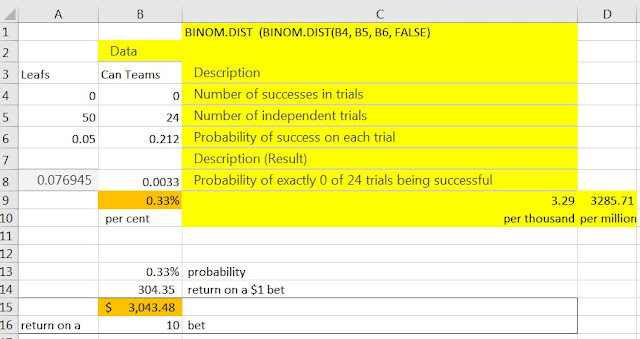 That’s somewhat less than what the Binomial Theorem estimate gave, but with such small probabilities, it can take a lot of runs for a Monte Carlo and a closed form solution to converge. Still, the results are pretty close, and both demonstrate just how unlikely this finding is, on statistical grounds. 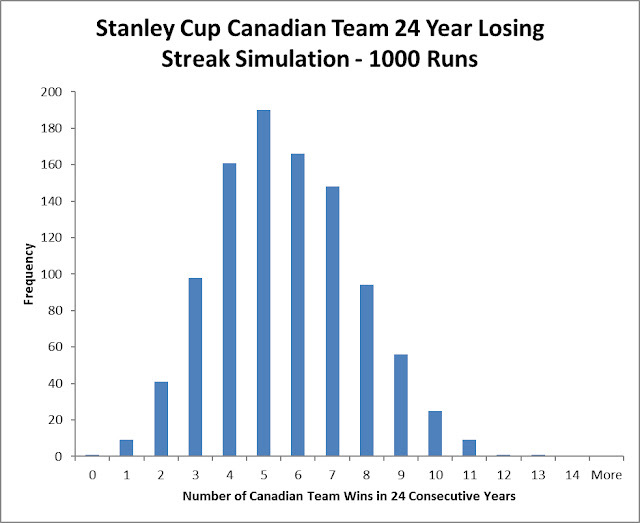 Note that most likely result, based on the Monte Carlo, is between 4 and 7 Canadian team wins during a 24 year stretch. That makes sense, as it corresponds to the percentage of teams in the league that are Canadian based. · It’s related to the Canadian dollar. 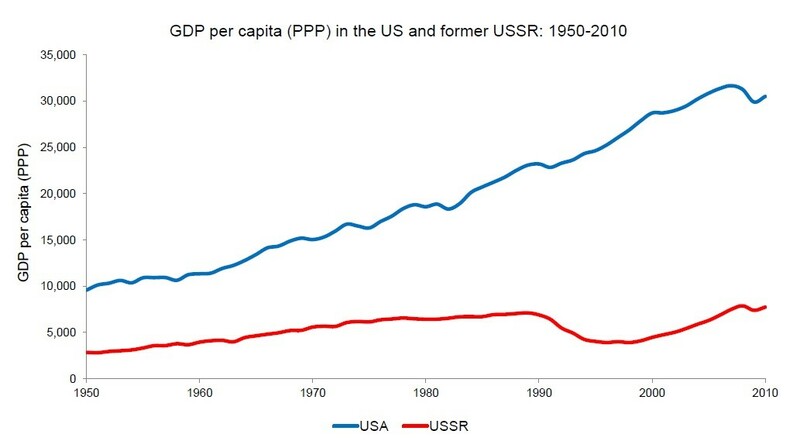 But that doesn’t work, as the Canadian dollar has varied considerably during this time period, sometimes being lower and sometimes higher than the U.S. dollar. · Another theory states that hockey players can’t stand the pressure of playing in the Canadian cities, where the sport is taken very seriously by the fans. Therefore, the players choke, basically. That theory seems unlikely – after all, professional athletes have come through a grueling system of training and preparation to make it to the big leagues. They know how to handle stress. · It’s a conspiracy - the league helps the U.S. teams win (say, via referee decisions or Board of Governor actions), to help out teams in the more financially uncertain U.S. marketplaces. But, that seems like a difficult to conspiracy to actually make work, as the league simply doesn’t have that sort of control over the referees or the owners. · Economics - Canadian teams can make as much money losing as they can winning, so they don’t manage their business affairs with winning as a significant priority. Indeed, playing rope-a-dope with Canadian fans might be an optimum strategy, keeping player payrolls relatively low, while holding out “wait until next year” hopes for the hockey-mad fans, who will show up, come what may. Perhaps the Canadian sports media will give another go at this. In recent years they have nodded towards the strange phenomenon each spring, almost as a ritual now. Their explanations are usually pretty lame, and they also reveal their weakness with statistical reasoning during these efforts. Not that I expect much from a journalist, when it comes to math. 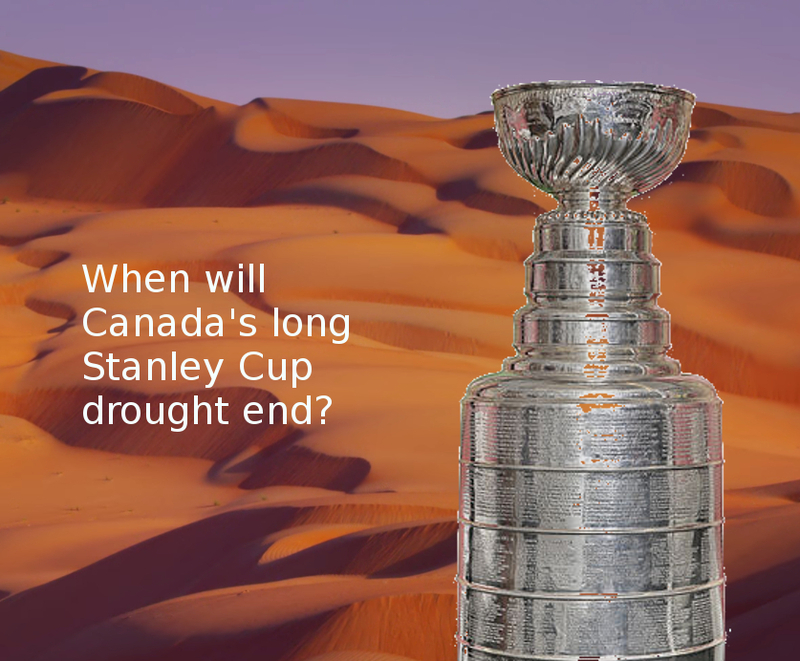 At any rate, the Great Canadian Stanley Cup Drought is truly a conundrum. If you have some spare time, possibly due to lack of interest in the NHL playoffs, you might want to consider a nice road trip, exploring the non-hockey contrasts between Canada and the U.S.. 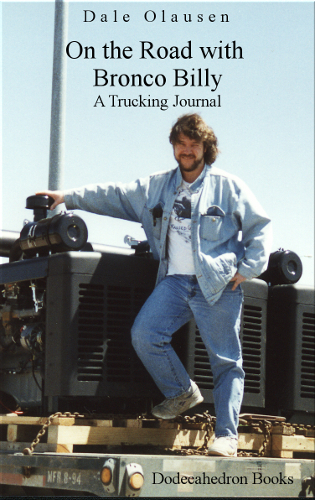 If so, then “On the Road with Bronco Billy” is definitely your book. 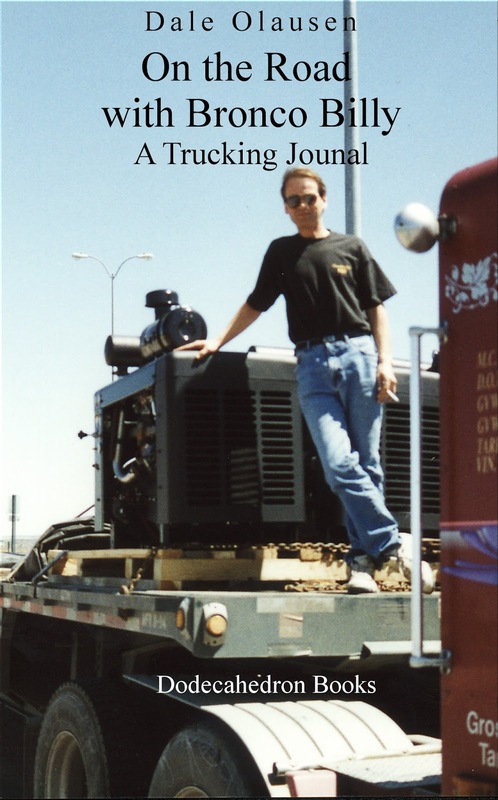 Sit back and go on a ten day trucking trip in a big rig, through western North America, from Alberta to Texas, and back again. Explore the countryside, learn some trucking lingo, and observe the shifting cultural norms across this great continent. There's even some hockey playoff talk (Oilers-Denver and Oilers-Dallas), for those nostalgic for Canadian playoff representation. It’s on Amazon (ebook), for a mere 99 cents (U.S.). 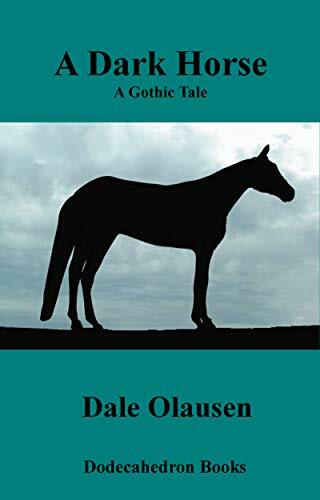 Or, if you want to continue contemplating mysterious runs of luck, you could try “A Dark Horse”, which concerns the troubling run of good luck that a (fictional) horse player experiences. 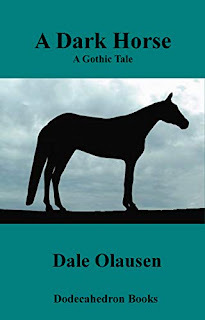 Also on Amazon (ebook), for 99 cents (U.S.). Does learning probability and statistics improve critical thinking? This is an interesting question. Naturally, much of the answer hinges on just what is meant by “critical thinking’, as another Quora responder noted. It’s a vague term that can be interpreted in many ways. Literary or Cultural Critical Thinking. We all learn a bit of this in school and via our discussions with others about cultural matters, including what we see or read in the media. But, I think most of us would generally agree that a lot of it comes down to “taste”, which differs from person to person and group to group. So, does knowledge of statistics and probability help in this regard? Perhaps a bit – for example, we do note how successful various cultural products are in the marketplace, via such statistical markers as sales, books sold, movie attendance and so forth. That can be somewhat helpful in separating the wheat from the chaff, but only up to a point. We all know of many examples of high quality products that didn’t get the attention that they deserved, and low quality products that were far more successful than they had any right to be. Statistics and probability also help us to judge the likely truth value of cultural works – i.e. how well the story or song content lines up with known facts, if they are available. People with a good grounding in statistics and probability are more likely to be skeptical of cultural products than those without such a grounding, if the story seems highly improbable (though we might still enjoy it from an escapist point of view). 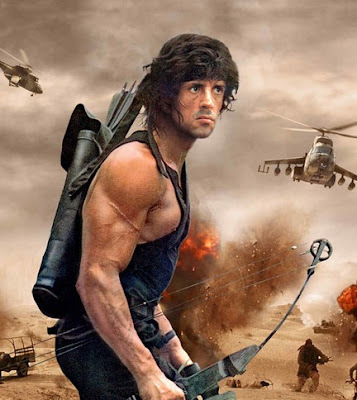 So, for example, statistically minded people are less likely to take adventure movies seriously, if the hero mows down 500 of the enemy without ever being hit by one of them. So, probability and statistics are helpful to critical thinking here, but they are generally of secondary importance in this domain. Political, Religious and Social Critical Thinking. We learn this from family, school, church, media and the surrounding social world in general. Most of this relates to “values”, or efforts to persuade us of various ideas and modes of life that are considered to be appropriate by these influencers. Does knowledge of statistics and probability help in this domain? I would say quite a bit. Of course the belief in the usefulness of ideas like statistics and probability can be highly value weighted itself, but I will leave that aside, and just assume that most people believe that testing values and ideologies against evidence is a good idea, at least in principle (religion is somewhat immune from this). In these areas a proper knowledge of statistics and probability can be extremely helpful for critical thinking, as they aid us in evaluating the actual real-world results of various values and ideologies. For example, if underlying ideas that lead to certain policies don’t seem to work, as judged by statistical evidence, we are quite likely to abandon those ideas, or at least significantly revise them (though that can take quite some time). There will be a lot of conflicting claims and counter-claims advanced to support or refute various ideas – a good grounding in statistics and probability theory can help us to sort out which claims (and claimants) that we ought to put our trust in, though it’s not infallible. Statistics can be used to mislead, but that just reinforces the need for critical thinkers to really understand statistics and probability, so that they won’t be thrown off, by a misleading graph or correlation vs causation argument. So, a good knowledge of probability and statistics can be very helpful here, as many of these issues are capable of being subjected to real-world tests. But, one must always be careful, as not all social questions are amenable to statistical analysis, and even when they are, it can be very difficult to determine which dataset and which statistical arguments one ought to find most compelling. Personal and Relationship Critical Thinking. I think we use probability and statistical thinking a lot in these domains, though we often aren’t aware if it. Sometimes it is unconscious. For example, we often estimate how much we can trust a person or a situation, based on prior experience and a sub-conscious probability calculus. We often call this intuition or gut feeling, but in my opinion those are generally terms used in place of “sub-conscious probability calculus”. Some people are better at this than others, and it seems to me that knowing probability theory probably makes a difference in this regard, even at this sub-conscious level. At other times our use of statistical and probabilistic reasoning is conscious but not necessarily rigorous. For example, we might consciously think that our probability of succeeding at something is high or low, but not be able to put a specific number on it. But it is still useful to know such basic facts about probability, such as high probability X low probability = low probability, so that we can more carefully evaluate a course of action. Being able to understand the difference between independent events and dependent events can also help one to avoid costly errors. And the understanding that correlation is not necessarily the same as causation can be crucial in day to day critical thinking. Finally, there are those occasions where a deep knowledge of probability and statistics can affect a person’s life in a major way. 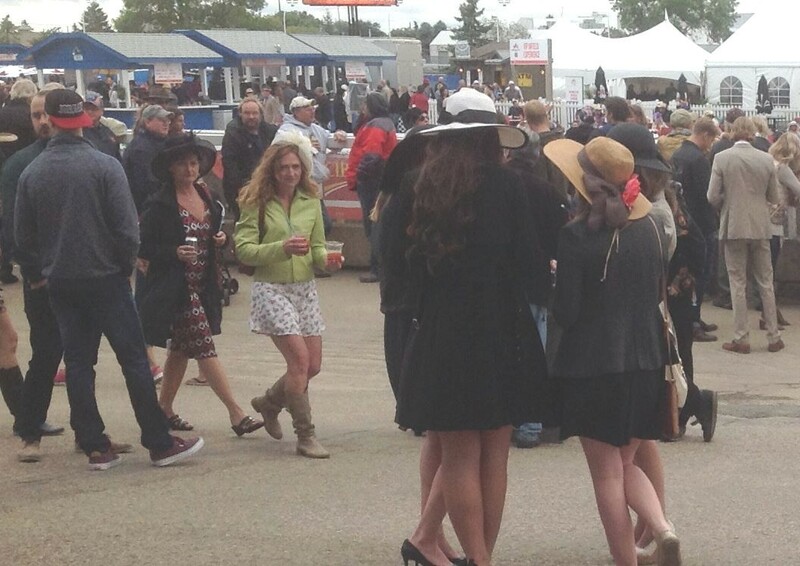 For example, I once had a major flirtation with gambling, particularly horseracing. That led me to study probability and statistics at a young age and eventually work in the field, which proved to be professionally and financially advantageous. I had a pretty good run at the track for a couple of years, based on collecting and analysing Racing Form data systematically. While doing so, I was motivated to take a lot of courses in mathematical statistics and multivariate analysis. I came to have a really deep appreciation for such things as the pitfalls of post-hoc multiple comparisons, data snooping, and atheoretical statistical analyses. Eventually my system quit working, and I gave back the money that I had won, after a lot of hard work. But, though I ultimately didn’t make a gambling windfall, I learned a lot about statistics and probability which turned out to be valuable throughout my life. It was fun and educational, but I could never play a negative expectation game (e.g. casino games), or a game with a high takeout (e.g. the track) for long after that. That probably saved me a lot of money and related grief. So, in conclusion: hurrah for statistics and probability theory, they really can help with critical thinking. Now that you have reflected upon some real math and science, you should read some science fiction. 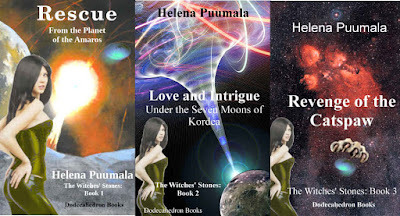 Either of the Kati of Terra series or the Witch’s Stones series would be excellent choices. 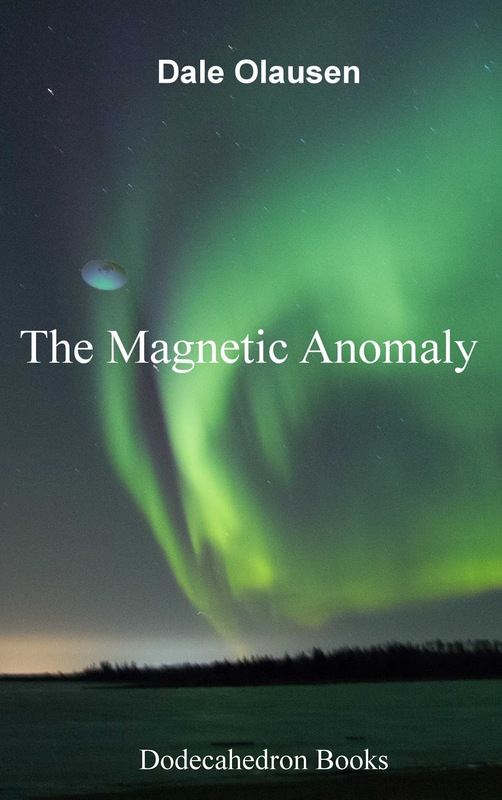 Alternatively, you could try the short story “The Magnetic Anomaly”, which features some references to Fourier analysis as used in geophysics, which is pretty mathy (though you don't need to know advanced math to enjoy the story).